Sludge Removing Internal Engine Cleaner. Safe. Quick. Ends tapping. Recovers Power in minutes. This Internal Engine Cleaner from Mega Power is a safe way to recover your engine's performance, an end tap, running, and power loss it causes, others brands can't, while removing sludge. Internal engine cleaner sludge removing treatment, Contact info: On a smartphone, to ask a question, order this product, call me...george at 512 665 3388.. This DIY cleaning method is a safe, economical way to recover your engine's performance while removing sludge. What you should know about Mega Power's Internal Engine Cleaner. First of all, Its cleaning idea and method is way superior from everyone else. One way...Mega Power is different... is, its not a solvent. Most mechanic's, quick lubes, and part store clerks feel you just rinse out your motor with a sludge remover additive - usually a solvent liquid, and that "cleaner" ends your problem. Not so! Many times, sludge removed re-settles. It blocks the oil pickup screen. Loss of oil-delivery then becomes a more costlier problem as engines seize up - and stop running. Engine flushes just cannot remove sludge and varnish on piston rings and valves that turn sticky bogging down their full function - but Mega Power does - shown by instant running improvement. motor movement. See Picture. 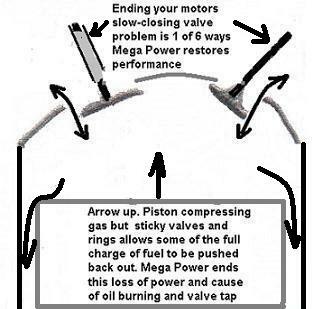 How Mega Power works as an internal engine cleaner. Mega Power uses 6 new internal engine chemical cleaners... Plus, they contain a friction modifier, and a co-polymer. As cleaning is done to other function start the restorative part. The friction modifier smooths and heals wear roughen - power-absorbing surfaces. The co-polymer fills worn surfaces to close wear gaps. The 6 total - chemical cleaners with the above advantages crawl into your motors tight gummed up part surfaces. There removing the toughest-to-remove varnish and sludge. Mega Power almost ignores sludge elsewhere as it causes no harm just sitting there, if not between a moving part. Those are different compared to a flush additive. Order now! 6 items shown. Includes easy-to-follow directions. Phone help if needed. Guarantee. Shipped to your door in about 3 days. Within a few minutes, removed residues and sludge - in all 6 areas of your motor has your motor running smoother, quieter and ends any problems affected by sludge and deposits. It cleans the the oiling delivery to every part. Really, the best engine sludge removing method is done during a $3000 engine over-hall. if not possible, This method is. This cleaning method, using the Mega Power Worn Motor Treatment, cleans your motor - top and bottom, including those areas in the picture above - the cause of your sludge, rapid wear, and performance problems. One steps cleans. Doing so is the easiest, safest, and best method so far invented to clean your motor. The other step restores your motor's power, smoother running, and helps puts off engine overhaul - for years, customers tell us. So will you! Driving does the actual fix - after you install the product. it's easy to do. Order this product today! Get on down the road of life again - trouble-free! You may have read in forums people suggesting transmission fluid, diesel fuel, even switch to synthetic oil - as a method to solve sludge problems. You read, those don't work! They suggest you get Wix filters, and change just the filter half way thru the oil change interval. The sludge problem persist. Some even suggest using solvent based engine flushes. You may have heard horror stories about those part store and quick lube flushes. _ All to no avail. It use no solvents! Instead, it uses anti-wear cleaners that go where oil can't to clean. This product restores your motor's great running performance again - in minutes. It also ends your motor valve tap, your oil loss oil burning, oil leak, and power loss problems, too! One half of your motor's sludge affected areas. Your problem is located in this piston valve area. 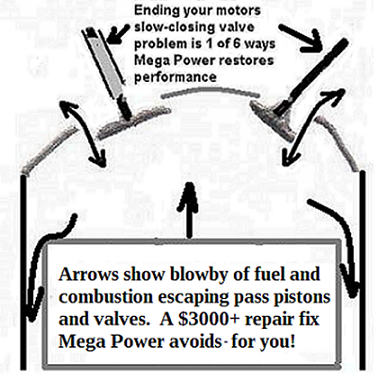 The arrows show the causes of your motor's sludge-caused rough idle, power loss, and blow-by. Our dirty engine cleaning method ends those problems - when nothing else can! The other half of your sludge problem is in your motor's oiling system, or both. Our new product removes sludge in those areas too - and then adds like-new dependability to your motor - while cleaning your motor clean. We call it Mega Power cleaning. What you should know about Mega Power internal engine cleaning. A friction modifier, and a co-polymer. The 6 item, within a few minutes, remove residues and sludge - in all 6 areas most affected by sludge and deposits. Not just the oiling section. Really, the best engine sludge removing method is done during a $3000 engine over-hall. Sludge forms when your motors piston rings become coating with oil breakdown and combustion residues. Sludge is acidic. Each time you change oil that sticky acidic film remains behind. Some of the additives in your fresh oil are consumed removing that residue or neutralizing those acids. That collection of residues begins to noticeably deter the like-new power development your car has. More than a tune up is needed. And plugged oil passage ways shut down oil delivery to your valves and valve lifters - tapping occurs, along with idling and fuel economy problems. Avoid solvent based cleaners, flushes, and solvent-based stop leaks. Solvents clean well, but destroy you motor oils lubricity. - as well as clean! That is because engine friction increases wear out at a much faster rate. Mega Power includes 2 friction reducing ingredients as part of your engine cleaning advantage. 3 of the Mega Power Motor Treatment ingredients have MC+ anti-wear advantages which stop friction drag from absorbing the motors power that should be going to the wheels - to speed you down the road, and end the speeding up of your motors wear out. The 6 item treatment cleaning result given feels like a sudden tune up - like power a bigger motor would produce, yet gives you fuel economy again, like a smaller motor gives. Its pretty amazing - the first drive experience after the install provides you. 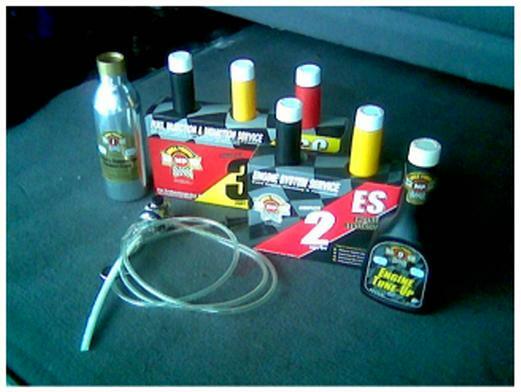 You need this product to end wear and performance problems now - and to extend your cars life! The Mega Power Worn Motor Treatment, internal engine cleaner. Ordering information and more details about this product detailed at the links above. 6 items shown. Includes easy-to-follow directions. Phone help if needed. Guarantee. Shipped to your door in about 3 days. Click shop cart button. Ordering: 6 items shown. Includes easy-to-follow directions. Phone help if needed. Guarantee. Shipped to your door in about 3 days.